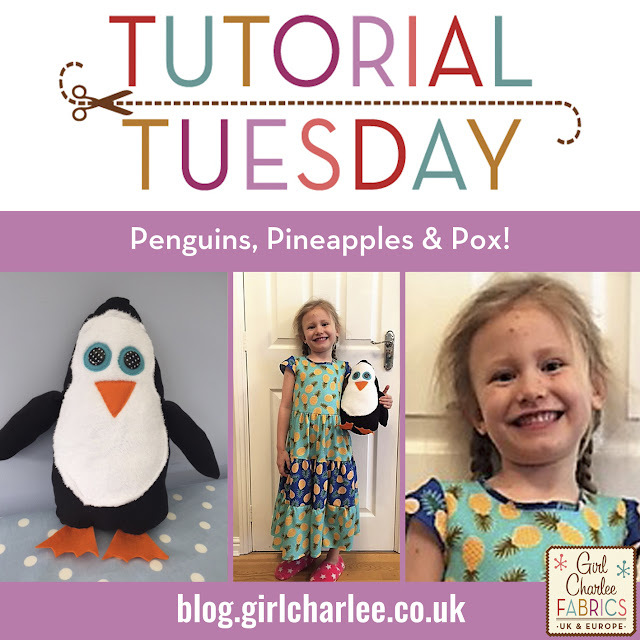 Girl Charlee Fabrics UK & Europe: Tutorial Tuesday: Penguins, Pineapples & Pox! Tutorial Tuesday: Penguins, Pineapples & Pox! Since Christmas, I must admit that I have really struggled to get my sewing mojo back! I seem to be quite good at starting various projects and then piling them up into my sewing basket! It took my daughter coming down with chicken pox to finally get it back! To keep her mind off the itchy spots we decided that a stuffed penguin would be our morning project (she is crazy about penguins at the moment!). The outline of the penguin was very basic. We drew an egg shape covering the size of a piece of A4 paper. The white part was more of a bean shape and the eyes, beak, wings and feet were also very basic shapes (as you can see from the diagram). We used these templates to cut out two of everything (apart from the beak and white fur tummy). I also added on a 1.5cm seam allowance. We started by sewing the fur straight on top of the front of the body. We then hand stitched the felt eyes, buttons and beak. We then sewed around the front and back of the penguin (right sides together) leaving a 10cm gap at the bottom for stuffing. We used an old cushion and pulled the stuffing out of that! Once it was stuffed enough, we stitched up the gap. We then stitched around the wings (right sides together) and left the top ends (to be joined on to the body) open. We then folded the openings in and sewed them straight onto each side of the penguin. As the feet were cut out of felt, we hand stitched them straight on to the base of the penguin. A very quick and basic toy penguin but my daughter loves it! I’m sure that this shape could work with other favourite animals (especially birds) too! Our next project was a summer dress and my daughter had already spied the fabric she liked! It may be February but we are already dreaming about the sunshine! We used the free pattern for the girls’ long dress from ‘Prima Magazine’ (March 2017). This pattern is very straight forward and lends itself beautifully to cotton jersey! My daughter decided to use both our blue and turquoise pineapples. I haven’t created a step by step guide as the pattern explains itself so well. However, here are a few tips for using a cotton jersey. Apart from when gathering the skirt layers, use a small zig zag stitch (with a stretch needle throughout). The pattern mentions using a bias binding strip under the arms (the dress has small capped sleeves) but I found that the armhole folded in nicely without. The beauty of using cotton jersey is that it doesn’t fray so you don’t really need the bias binding edge. When I joined the skirt layers, I used a straight stitch and a zig zag stitch over the top (just to make it a bit stronger). The dress pattern also includes a zip opening in the back of the bodice. I decided to replace this with 3 poppers. This was mainly because I didn’t have the correct colour zip to hand and we needed to be finished quickly! The poppers work perfectly and I will probably do the same if I make another one. All done... one happy (and distracted from itching) daughter! My daughter has chosen her favourite fabric combinations for contrast. Mix prints are very in at the moment, so this variation on mixing obviously shows her potential as a future fashion guru!